There are some foods out there that I just don’t like. It’s a fairly short list of foods… Pickles. Grapes. 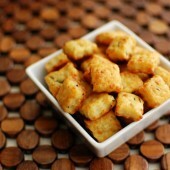 Cheez-Its. Actually, it’s not fair to call out Cheez-Its specifically. I don’t like any cheese flavored crackers. 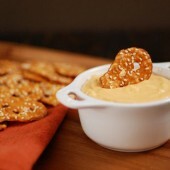 Goldfish and those packages of cheese crackers with peanut butter go on the list too. There’s just something about those orange crackers that I can’t stand. Hubby, on the other hand, loves Cheez-Its. It’s one snack he can have in the house that he knows I won’t touch. 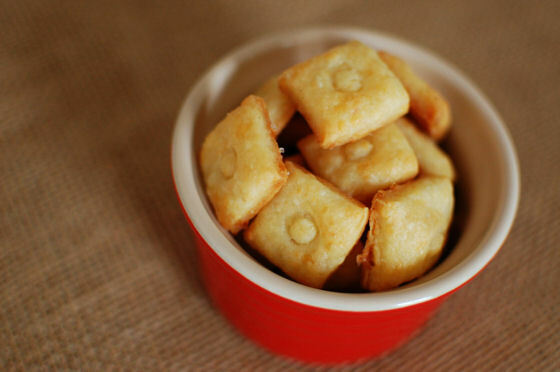 However, since I do the grocery shopping in our house, I rarely buy them… When I saw these Homemade Cheez-Its come up on Rachel’s blog, I knew I had to make them for Hubby. I figured if I made them myself and they weren’t neon orange, I might even like them as well. These crackers come together in no time at all. With just a few ingredients and a few minutes of your time, the dough is in the fridge to chill. Rolling them out is simple because the dough is not too sticky or fragile. I measured my crackers so they’d all be the same size. Since we’re still in our temporary apartment, I don’t have a cake tester or toothpicks in the house. I decided to use the end of a plastic straw to poke my crackers. 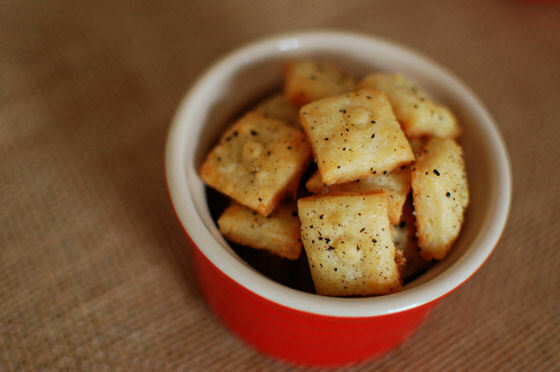 I love the button look that it gave the crackers! I also decided to sprinkle half of my dough with some freshly ground pepper. (The other half just got sea salt on top of them). 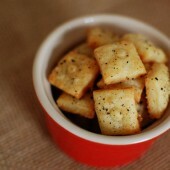 Hubby absolutely adored these crackers. We took these to our friends house for game name and they disappeared in no time flat. 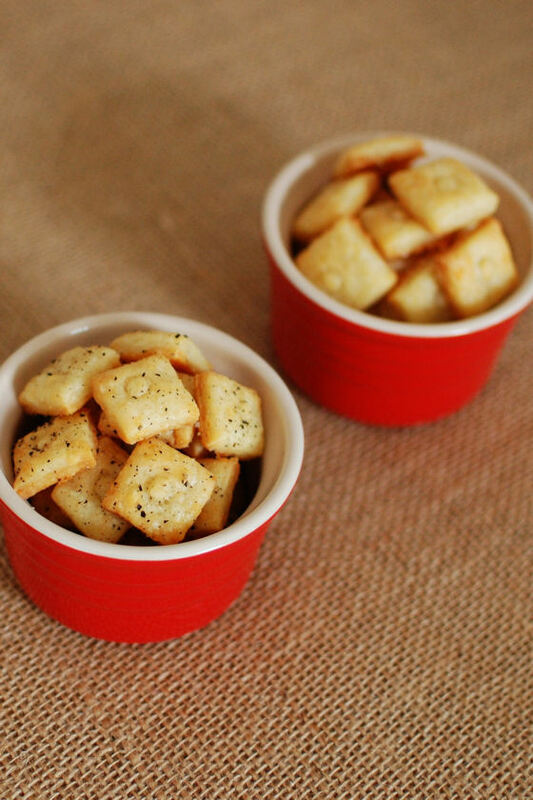 Even though the recipe yields 12 dozen crackers, they’re really small (1″x1″) and oh so tasty. 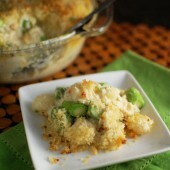 I promise, you’ll be wishing you made a double batch! One small tip for you. I rolled my dough out on my Roul’Pat. Since the dough is pretty thin, the easiest way to pick up the individual pieces was to actually put one hand under the Roul’Pat such that the pieces basically peeled right off of it. 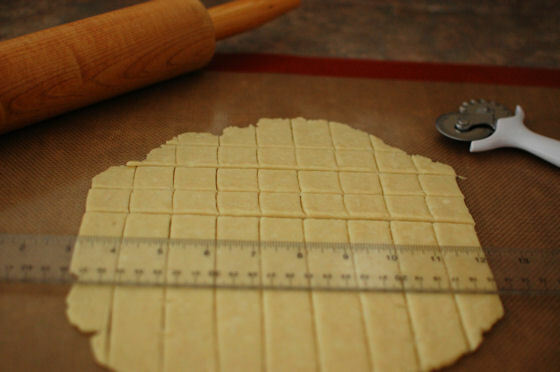 Obviously, if you roll your dough on your counter, that won’t work, but if you use a silicon mat to roll out your dough, this will help keep a uniform shape to your crackers. 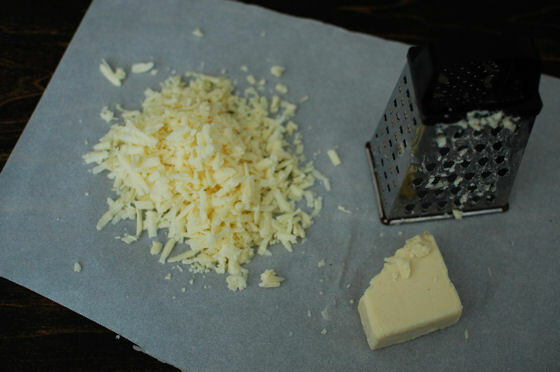 In the bowl of a stand mixer, combine cheese, butter, shortening and salt on medium-high speed. Reduce speed to medium, slowly add flour and water.